Schools on Tundra 4: Exhilarating! LCC students Victor Zhao’13 and Andrew Hamilton’13 had the opportunity to participate in ArcticNet’s Schools on Tundra program during the March Break. 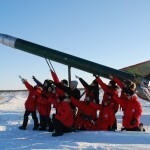 “Students and teachers participating in the Schools on Tundra program [had] the unique opportunity to conduct authentic field research in the sub-arctic, engage with scientists working out of the [Churchill Northern Studies Centre] and participate in lectures and workshops. Participants also [experienced] the diverse geology, biodiversity, cultural history, and wild beauty that the area around Churchill offers. Today was a very packed day in Churchill. After an early wake-up (6:30! ), we continued working on our model rockets. Most people finished assembling their rockets. I’m very excited for Monday’s launch! At about 10:30, we left for the day’s main event: dog sledding! We arrived at Blue Sky Expeditions a half hour later, eager to begin. Gerald Azure, the founder and trainer, walked us through how the sleds work. There were two sleds: one with space for one passenger, and the other with space for two. 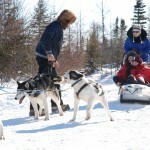 Both sleds were each pulled by a team of seven dogs. Blue Sky is unique in the way it treats its dogs; they believe strongly that the dogs shouldn’t be overworked, so each dog is “retired” into adoption at age eight. One of the dogs, who ended up being a lead dog for us, had recently been rescued from a home where she had been abused. You could see in both her timid nature and the scar above her eye that something wasn’t quite right with the dog psychologically. On a happier note, I think that I speak for the entire group when I say that we had a great time dogsledding. It is a completely unique experience, one which I find difficult to put into words, but I will say this much: The feeling is a mix of exhilaration, empowerment and, well, surprise when the dogs first take off. Then we went to sleep for the night. Or so we thought. 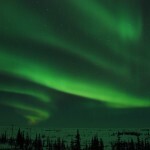 Around 11 o’clock, Max (one of the teachers accompanying the trip) woke us up to take a look at the northern lights. They were by far the best I’d seen so far on this trip, and the viewing dome was completely full for the first time. He managed to get some incredible pictures of the overpowering phenomenon, and those of us who managed to get up were staring at the sky in awe for a while. In the morning, we crossed the street to go to the elementary school to give the students a presentation about our experience on board the Amundsen. We didn’t realize we’d be presenting to such a young audience, but we did a good job adapting our presentation on the spot. It was nice to hear the students ask so many insightful questions. A science teacher at the high school then took us for a hike near the Coppermine River, just outside Kugluktuk. He explained the geological history of the area to us, which was much different than learning from a textbook because we were actually standing on the rocks he was telling us about. We came back and presented to the high school students. We also went to the grade 7 Inuinnaqtun class. An elder in the community told us some Inuit legends and explained the way she lived as a child. I find it remarkable to see how well the Inuit have adapted to a living a Western lifestyle in such a short period of time. Schools on Board: Leaving the Amundsen—by Helicopter! This morning involved some final packing and clean up, followed by boarding the helicopter to go back to Kugluktuk. No one wanted to get off the ship, but getting another helicopter ride was still fun. Once everyone had been flown over, we started walking from the airport into the community of Kugluktuk. We joined the grade 12 science class and the students took us on a scavenger hunt designed to have us see most of town. Being in Kugluktuk was different because everyone knows each other, and all the people were greeting us and asking who we were. Today, we learned about phytoplankton, which is important because it is responsible for most of the primary production in the Arctic ecosystem. Scientists want to know if the Arctic Ocean will be emitting or absorbing CO2 in the future due to climate change. It’s starting to feel like we will be leaving the ship really soon. We started discussing a farewell presentation for the scientists and crew. The helicopter pilot also started giving safety briefings to prepare us for getting off the ship.